← Mr. Cameron: Democratic or Dogmatic? I remember singing along to an oft-recited Hindi poem as part of a 13-member peace delegation to India in the summer of 2001. One couplet always resonated with me deeply, reminiscing the loss of humanity, its words ran something like this: “Mandir, masjid, Girja-ghar nay baant diya baghwaan ko – Dharti baanti, saghar baanta, mat baanto insaan ko” (i.e. Temples, mosques, cathedrals have all divided God – We divided nations, we divided seas, lets not divide man). Today, these words are a poignantly chilling reminder of a nation whose schools have entered the grotesque hall of shame joining churches and mosques wherein the blood of hundreds of innocent civilians has flown. 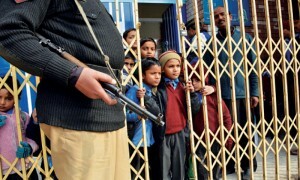 The recent attack on the Bacha Khan University in Charsadda last week that killed at least 30 people – mostly children and teachers – has renewed the still relatively fresh wounds from the deadly Peshawar school massacre in December 2014 when armed gunmen besieged the Army Public School killing almost 140 people – mostly children. The ghastliness of the attacks transcends the capabilities of linguistics – bringing to mind the words of Margaret Atwood who once proclaimed, “All writers feel struck by the limitations of language” – and the appalling and barbaric slaughter of school children attending an otherwise normal day in school is wholly impenetrable to words. How do you describe the indiscriminate carnage and savage butchery of young children? Khalifa Umar Mansoor’s faction of the Pakistani Taliban took responsibility for the attack – the Peshawar school assault also having been claimed by him. Two days after the Bacha Khan massacre, Mansoor released a video vowing to target schools across the country, calling them “nurseries” that produce apostates that challenge God’s sovereignty. The Taliban Commander said that schools, colleges and universities all would not be spared, asserting that his faction will “demolish their foundations.” The defiant message from Mansoor demonstrates how the Pakistani Government’s strategy in tackling the Taliban is not only failing but is in fact emboldening extremists. Army offensives have only fanned militants to retaliate and negotiated peace deals have broken down. Four days following the attack in Charsadda, threatening graffiti appeared on the walls of a girls school in the outskirts of Faisalabad warning that if the school was to commence classes from Monday, January 26th, it would be blown up. Pro-ISIS graffiti has also been spotted in places in Gilgit and Peshawar welcoming the self-proclaimed caliphate of Abu Bakr al Baghdadi. Meanwhile, a study by the Pew Research Center revealed last year that Pakistan was the only country out of the 11 surveyed where the majority offered no definite opinion on ISIS – unlike the majority e.g. in Jordan where 94% of people held unfavourable views about ISIS. As I try and make sense of Charsadda, I can’t help reflecting over the time I went to school in Pakistan. My memories of my school days are some of my fondest: they epitomise an inherently carefree existence, which symbolised equally learning in the classroom and the innocent mischievousness of young adolescents getting enthralled by the idea of skipping class to sneak to the school canteen or racing down corridors only to run straight into a senior administrator. I was fortunate to have been schooled in a less conventional environment when my mother, a schoolteacher, partnered with two of her long-standing colleagues and intellectuals to start her own school with a liberal mandate in Islamabad. By contrast, I have also witnessed village school children in some of the most rural areas in Pakistan enthusiastically doing homework with chalk and slates under lantern lights. And as I reminisce over these multitude of school experiences in Pakistan and slip back into my shoes as a young school girl in Islamabad, it is gut wrenching and unfathomable to imagine a day where school children like myself and my classmates could be privy to the macabre scenes that unfolded in Peshawar and Charsadda. It is equally inconceivable to think of the young Malala Yousafzai being shot in the head by the Taliban as she returned home from school one afternoon. 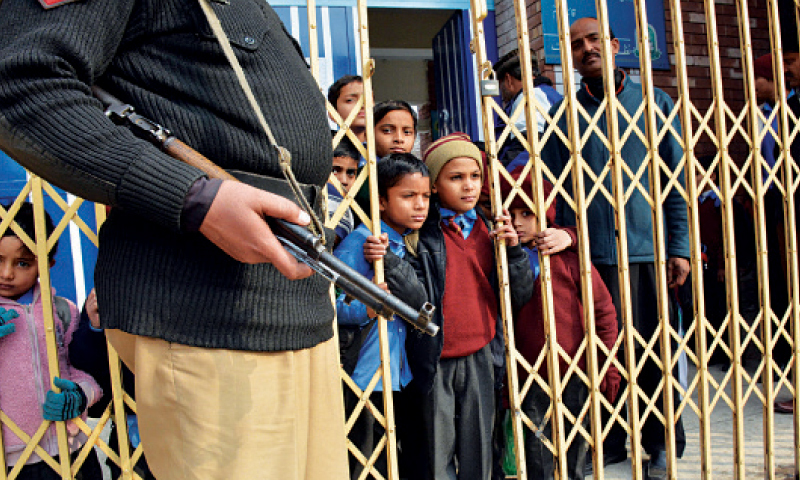 When the Pakistan Army launched its offensive against the Taliban in 2009, the militant group responded through a wave of deadly suicide blasts that besieged all major cities in Pakistan, causing schools to close down for several weeks. Working for a commercial litigation practice in Lahore at the time, I would drive down a major road in the heart of the city every morning to get to work – crossing a kindergarten school on the way. And every morning I would see young toddlers being escorted in through a barrage of sand bags and barbed wires by their mothers, and I would wonder what world view was being shaped in their innocent, yet vulnerable minds? It is a worldview no mother would ever want her children to grow up with. Today, when I think of my own 21-month old, it is hard for me to imagine sending him to school under such precarious circumstances. My heart and mind are often with children growing up and going to school in Pakistan. As they confront their daily challenges in pursuing a fundamental freedom, I am compelled to think that what is happening in Pakistan is a deeper and more disturbing form of massacre – a massacre of morality – a depravity that is resulting in a wider genocide of common humanity. And unless Pakistanis stop it in its tracks, it will beleaguer and obliterate all sense of human dignity, ethics and virtue from their country.